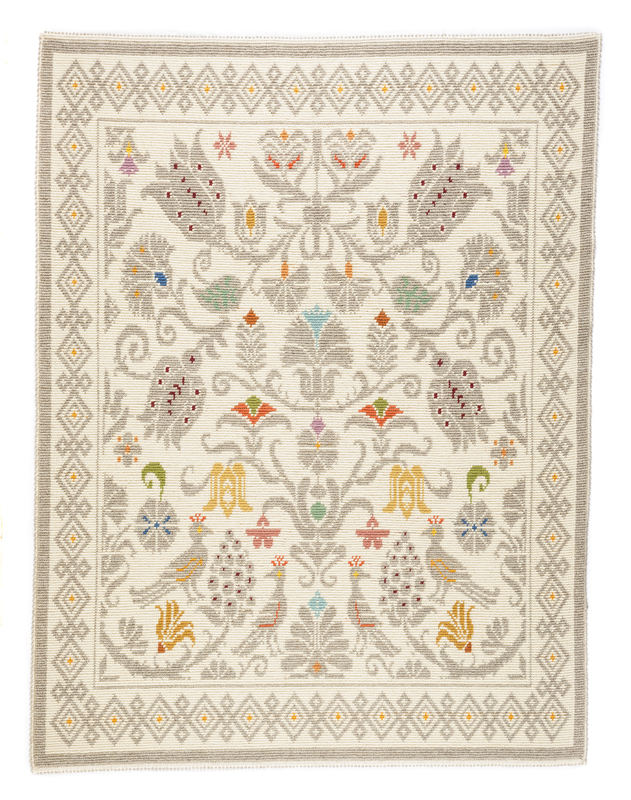 Elegant blossomed branches and small colourful birds characterise this large woollen carpet with a garden design. Crafted according to the tuttopieno (full bodied) pibiones relief technique, it has a grey motif against a natural white background, made bright by vivid colours. 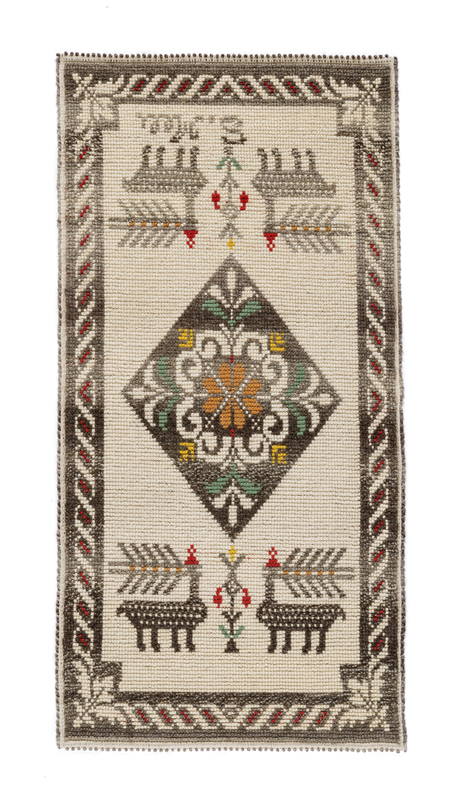 This elegant woollen carpet is crafted according to the tuttopieno (full bodied) pibiones relief technique. Striking large woollen carpet crafted according to the tuttopieno (full bodied) pibiones relief technique. 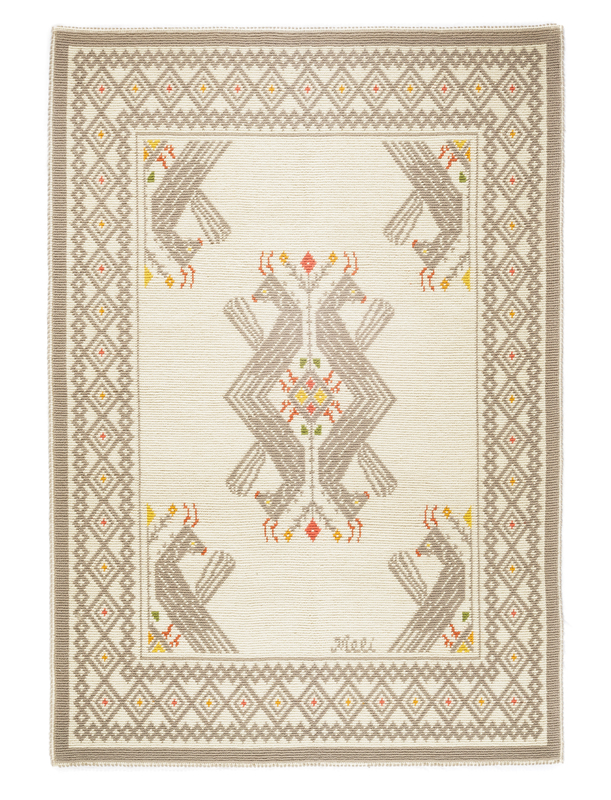 Large stylised birds and the rich geometric-patterned border characterise this elegant carpet crafted according to the tuttopieno (full bodied) pibiones relief technique. 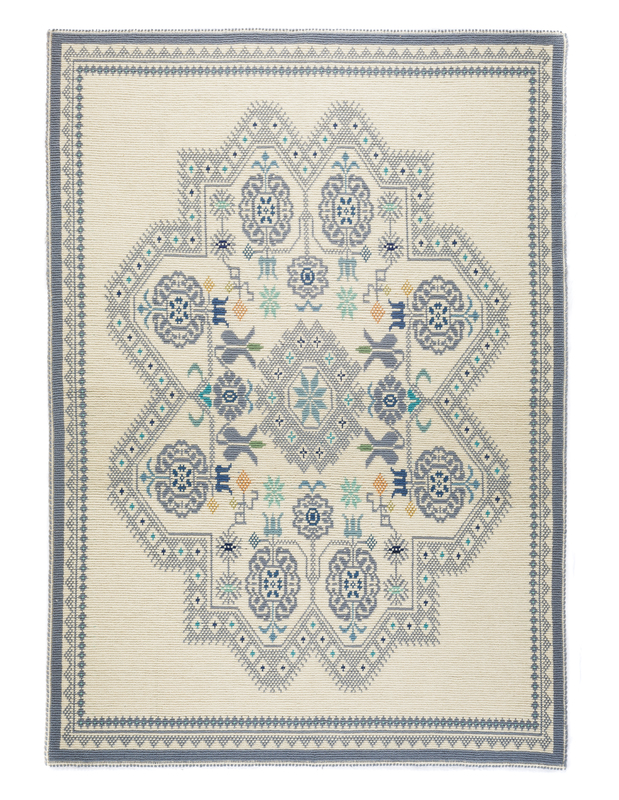 The elegant large carpet in wool is crafted according to the tuttopieno (full bodied) pibiones relief technique. 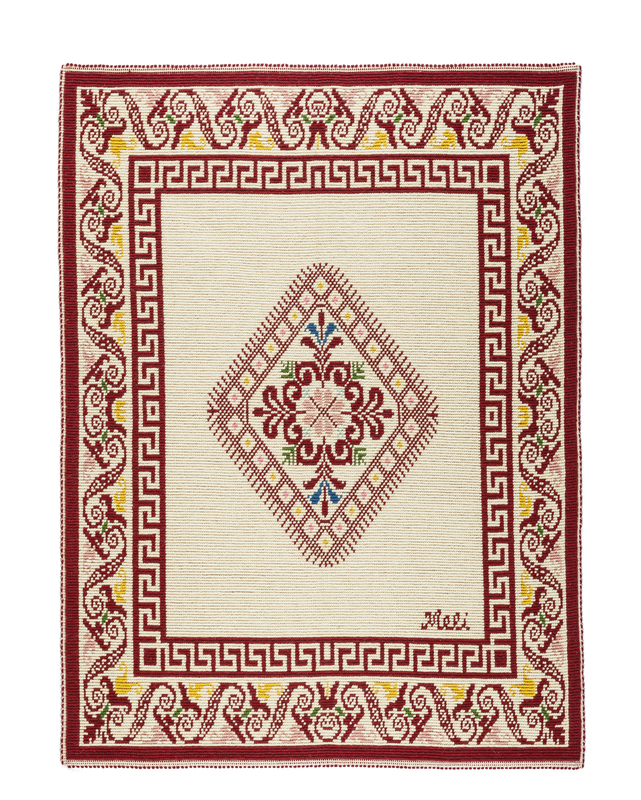 Stefania Meli’s story as a weaver is rooted in ancient family and village traditions. Villamassargia, her home town in the Sulcis-Iglesiente region, is a renowned centre of the ancient home weaving craft that has become, in time, an entrepreneurial activity thanks to the many workshops that were originally set up in the 1960s, applying new concepts of production. In this positive context, Stefania learned the traditional local a scèrasa technique when she was very young from her grandmother and from the well-known elderly weaver known as Zia Fanny. On the spur of her initial curiosity, when she was 14 she undertook a professional path working in a well-established workshop in her village, where she learned the common a pibionis technique. In the 1990s she set up her own business, at first in partnership with her sister, and then autonomously, improving her technique and style with striking professional growth. Her creations are promoted and sold at trade fair events and shops in the main tourist centres of the island that specialise in high-quality local handicrafts. A wide range of products made with the a pibionis technique are produced in Stefania’s workshop: large wool, linen and cotton carpets; various types of coordinated items for the table, table cloths, table runners, American place mats, centrepieces, as well as textiles for upholstery, bedspreads, furnishing accessories and headboards. These are complemented by the reproduction of traditional tapestries woven according to the typical a scèrasa technique. Stefania’s products are woven according to the traditional hand-made relief or grosgrain technique, locally known as a pibiones, in the tuttopieno (full-bodied) or semipieno (half-bodied) versions. The a scèrasa technique is also carried out on commission, mainly for customers interested in reproductions of ancient local tapestries.